President Tsai is greeted by supporters as she arrives for a stopover in Hawaii on March 27, 2019. Taiwan’s President Tsai Ing-wen just capped a visit to diplomatic allies Palau, Nauru, and Marshall Islands, with a Wednesday stop in Hawaii. While on U.S. soil, Tsai spoke via Skype to the right-wing Heritage Foundation in Washington, D.C., accusing China of altering the “status quo” of cross-strait peace and calling for “closer partnerships with like-minded countries” such as the United States, from whom it is seeking to buy fighter jets despite the objections of Beijing. 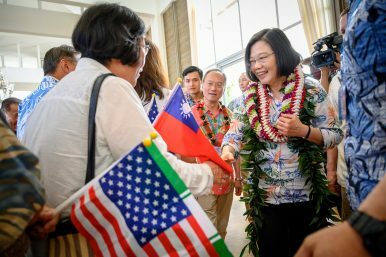 The visit was an opportunity for Tsai, who is seeking the nomination of her Democratic Progressive Party (DPP) to run for re-election, to cement ties with three of Taiwan’s 17 remaining diplomatic allies. However, Taiwanese media largely focused instead on a trip to Hong Kong, Macau, and China by Kaohsiung Mayor Han Kuo-yu of the opposition Kuomintang (KMT), who polls as Tsai’s most potent challenger in the upcoming 2020 presidential election. Han, who has not announced a run for president despite deafening speculation, insisted his trip was strictly trade-focused, saying he intended to sell Taiwanese fruits and vegetables. 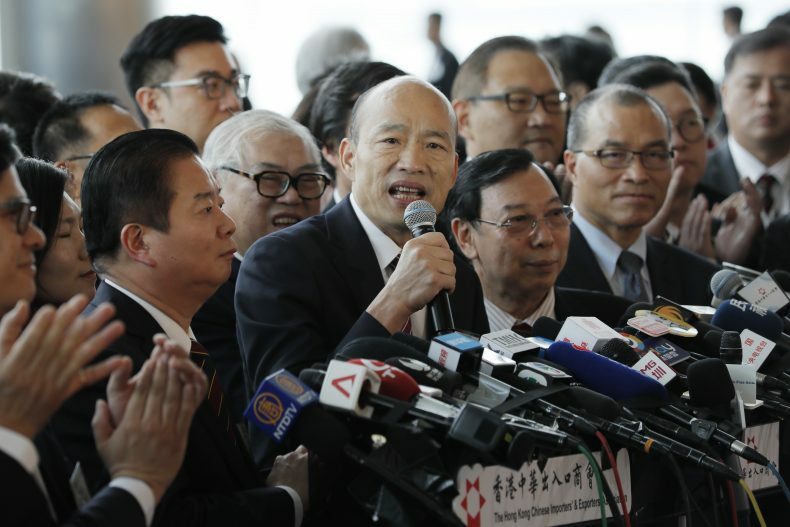 But DPP officials and pro-independence groups in Hong Kong criticized the warmth toward Beijing shown by the brash and polarizing mayor, with the latter urging Han and the KMT not to “sell out” Taiwan. Tsai’s official visits to three Pacific Island allies may have lost the media limelight to Han’s journey to People’s Republic of China (PRC) territory, but the trip by the Taiwanese leader, who is being challenged in her own party’s primary by her former premier, could prove highly consequential. Tsai promised a tourism boost to Palau, which has suffered after charter flights between the microstate and China were cut back last year. In Marshall Islands, Tsai was on hand for the signing of a memorandum of understanding (MoU) to fund small loans for businesses led by women. During Tsai’s visit to Nauru, the country’s parliament passed a resolution recognizing Taiwan as a sovereign and independent country and rejecting Beijing’s “one China principle.” Nauru has often taken the lead among Pacific Island nations in publicly supporting Taiwan: Last September, President Baron Divavesi Waqa slammed China’s “arrogant” behavior in the region at the Pacific Islands Forum. Months earlier, the Sydney Morning Herald revealed a secret deal to send Australian refugees in Nauru to Taiwan for medical treatment to stop them from applying to remain in Australia, a measure sharply criticized by human rights advocates. In February, Nauru was one of six Pacific Island nations to call for China and Taiwan to receive equal diplomatic recognition by regional states. Such a move could upend the various forms of “one China” recognition adhered to by all 193 UN member states and instead allow for a model of dual recognition. This would contradict the policies of Beijing and the KMT but coalesce with that of the DPP, which refuses to recognize the so-called “1992 Consensus,” an alleged agreement between the Republic of China (ROC) and PRC governments that there is “one China” but each side is free to interpret what that means. Tsai ended her visit in Hawaii, where she spoke to a group at Washington’s Heritage Foundation that included U.S. Republicans Senator Cory Garner and Representative Ted Yoho, both vocal supporters of Taiwan. “Taiwan does not stand alone” against pressure from Beijing, Tsai said in remarks delivered via a video link. “The U.S. commitment to Taiwan is stronger than ever.” She cited potential U.S. arms sales to Taiwan, which has submitted requests to purchase F-16V jets and M1 Abrams tanks. Mayor Han Kuo-yu speaks to the media after attending an agricultural and fisheries expo in Hong Kong, March 22, 2019. AP Photo by Kin Cheung. The KMT, despite traditionally supporting the “1992 consensus,” initially rejected Xi Jinping’s interpretation of the consensus as a “one country, two systems” model of governance. But party leaders have since reaffirmed their commitment to the 1992 consensus as a bedrock for cross-strait ties, with KMT Chairman Wu Den-yih proposing a potential cross-strait peace treaty with China should his party win the presidency in 2020. Han Kuo-yu reaffirmed his own support of the consensus during a Monday meeting in Shenzhen with Liu Jieyi, director of China’s Taiwan Affairs Office, calling it critical to facilitating economic and cultural ties. During his visit to southern China, Han agreed to sell $168.5 million worth of agricultural products to Chinese cities in deals the Hong Kong-based Sing Pao Daily News reported were overseen by Beijing. Han and Liu touted the potential for further ties between China and Kaohsiung, which elected Han in a shock result in November after decades of DPP rule. Along with other newly elected KMT mayors, Han has spoken fondly of the potential for city-to-city exchanges between Taiwanese and Chinese cities. Han thanked Liu for China’s support of the estimated millions of Taiwanese working or living in China, while Liu said “the two sides of the Taiwan Strait are one family” – a statement that has been politically combustible in Taiwan since independent Taipei Mayor Ko Wen-je first made it at a 2015 twin-city forum in Shanghai, igniting a fierce backlash from large swaths of his Beijing-skeptic supporters. Chinese officials have refused to meet with Taiwanese leadership since the DPP came to power in 2016 after eight years of KMT rule under former President Ma Ying-jeou. They have, however, held meetings with local leaders, especially those affiliated with the KMT and seen as more friendly toward the PRC. In Hong Kong, Han met with Wang Zhimin, the director of China’s liaison office in Hong Kong. Han also agreed to sell $74.5 million of agricultural products to Hong Kong in a meeting with Chief Executive Carrie Lam, marking the first time a Hong Kong leader had met a Taiwanese mayor since June 2014, according to the Hong Kong Free Press. Han’s actions were criticized by Tsai, who called China’s liaison office a symbol of the imposition of “one country, two systems” in Hong Kong. Since Xi’s January speech, DPP officials have frequently pointed at Hong Kong as an example of how the framework, if implemented in Taiwan, would erode democratic values and human rights protections. Other DPP figures questioned whether Han’s sole intention was to promote trade, given his meetings with top Chinese officials. Both Tsai and Han promoted their trips as gestures of goodwill. As they both return to Taiwan, they enter a fragmented and polarized political battlefield, which could end with the two facing off in an election set to determine the near-term future of Taiwan’s democracy and sovereignty.